Today is the celebration of St. Willibrord, a British-born, Irish-trained, Roman-commissioned Benedictine who evangelized the Netherlands (or in the words of the Roman Martyrology, “Friesland and Denmark”). As such he is hailed as the patron and apostolic father of the Old Roman Catholic Church of the Netherlands, the original See of Utrecht. In about 678 Willibrord, a 20-year-old monk taught by St Wilfrid, left his Yorkshire monastery at Ripon and moved to Ireland. Inspired by the great tradition of Irish missionaries, he set out in 690 for the northwest coast of continental Europe. The region of Frisia, or Friesland, was still pagan but had recently been conquered by Pepin, the founder of the Carolingian dynasty. Willibrord brought with him eleven companions (more modest in its apostolic implication than the twelve companions of the earlier Celtic tradition). After destroying idols, Willibrord and his companions were thrown into jail and their lives were gambled for with the pulling of lots. Only one of the companions was given the martyr’s crown. When Willibrord was faced with the pagan King Radbod, he answered his questions so boldly, that the king did not kill Willibrord but returned him to Pepin with great honors. The missionaries rapidly established a foothold in the region. With Pepin’s support, Willibrord was in a position by 695 to be consecrated archbishop of a new see in Utrecht. Willibrord also founded a great monastery at Echternach, where he died in 739. The earliest Life of Willibrord, written, as Theofrid, Abbot of Echternach (1083­1100), tells us, by an unlearned Scot (i.e. an Irishman) in a rough and unpolished style, has disappeared, though its contents may be reconstructed from the biography composed by Alcuin, who probably used it as his source. Alcuin, the author of the present Life, was born in York in 735 and became the master of the school there in 778. Four years later he was appointed head of Charlemagne’s school at Aix ­la ­Chapelle [Aachen] and became a leading member of that select circle who supported the emperor in his efforts to re­educate Europe. In 796 he was removed to Tours and died in 804. His Life of Willibrord was written at the request of Beornrade, Abbot of Echternach and Archbishop of Sens. As a relative of Willibrord and legal possessor of the Monastery of St. Andrew, founded by Willibrord’s father, Wilgils, on a headland overlooking the mouth of the Humber, Alcuin must have undertaken the work as a kind of tribute to his family connecyions. The Lord made a covenant of friendship with him, and made him a prince; that he should possess the dignity of priesthood forever. Ps. 131:1 Remember, O Lord, David and all his meekness. v. Glory be to the Father and to the Son and to the Holy Ghost, as it was in the beginning, is now and ever shall be, world without end. Amen. 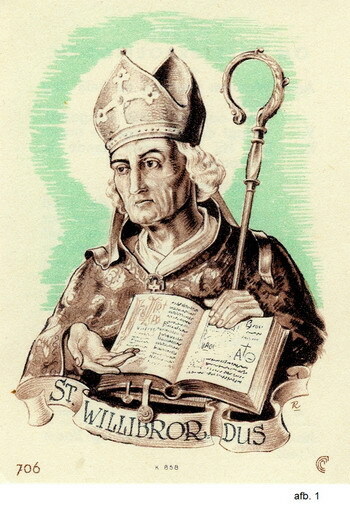 O God, Who didst vouchsafe to send thy blessed Saint Willibrord to preach Thy glory to the Gentiles : we humbly pray Thee that, by his intercession, we may both see and know the things which we ought to do, and by Thy mercy be enabled to perform the same. Through Jesus Christ, Thy Son, our Lord, Who livest and reignest with thee, in the unity of the Holy Ghost, ever one God, world without end. Amen. Almighty, eternal God, Who granted us to honor the merits of all Your Saints in a single solemn festival, bestow on us, we beseech You, through their manifold intercession, that abundance of Your mercy for which we yearn. Through Jesus Christ, thy Son our Lord, Who liveth and reigneth with thee, in the unity of the Holy Ghost, ever one God, world without end. R. Amen. Lesson from the book of Ecclesiasticus: Behold, a great priest, who in his days pleased God, and was found just; and in the time of wrath he was made a reconciliation. There was not found the like to him, who kept the law of the Most High. Therefore, by an oath, the Lord made him to increase among his people. He gave him the blessing of all nations, and confirmed His covenant upon his head. He acknowledged him in His blessings; He preserved for him His mercy; and he found grace before the eyes of the Lord. He glorified him in the sight of kings, and gave him a crown of glory. He made an everlasting covenant with him, and gave him a great priesthood; and made him blessed in glory. To execute the office of the priesthood, and to have praise in His name, and to offer Him a worthy incense for an odor of sweetness. You are a priest forever, according to the order of Melchisedec. Alleluia. I have found David, My servant; with My holy oil I have anointed him, that My hand may be always with him, and that My arm may make him strong. May Your Saints, we beseech You, O Lord, everywhere make us joyful: so that, while we reflect upon their merits, we may enjoy their help. Through Jesus Christ, thy Son our Lord, Who liveth and reigneth with thee, in the unity of the Holy Ghost, ever one God, world without end. R. Amen. We offer You, O Lord, the gifts of our service; may they be pleasing to You for the honor of Your just ones and, through Your mercy, bring us salvation. Through Jesus Christ, thy Son our Lord, Who liveth and reigneth with thee, in the unity of the Holy Ghost, ever one God, world without end. R. Amen. Grant, we beseech You, almighty God, that as we thank You for the favors we have received, we may, by the intercession of blessed Willibrord, Your Confessor and Bishop, obtain still greater blessings. Through Jesus Christ, thy Son our Lord, Who liveth and reigneth with thee, in the unity of the Holy Ghost, ever one God, world without end. R. Amen. Grant Your faithful people, we beseech You, O Lord, ever to rejoice in the veneration of all the Saints, and to be protected by their unceasing prayers. Through Jesus Christ, thy Son our Lord, Who liveth and reigneth with thee, in the unity of the Holy Ghost, ever one God, world without end. R. Amen.